In some cases a Graphic Overlay provides the only link between your Company’s name and the product you sell. A Graphic Overlay is often the “window dressing” on an otherwise plain box. AGE Nameplate uses only the highest quality materials to produce your Graphic Overlay… Because YOUR Image is Everything! At AGE Nameplate the process begins in the pre-press department. Our graphic artists will perform color-separation on your “camera-ready” or even design your art work for you. Then they stipulate the process steps, providing a seamless transition from concept to production. Completed art work is sent to you for review and approval before production takes place. 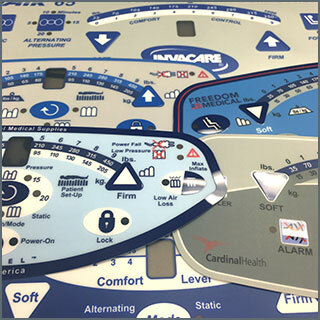 Unlike paper printing, Graphic Overlays begin with high quality clear polyester or polycarbonate substrates. Layers of ink are applied to the underside of the substrate, starting with the darkest colors and/or fine graphic details, concluding with the lighter colors. 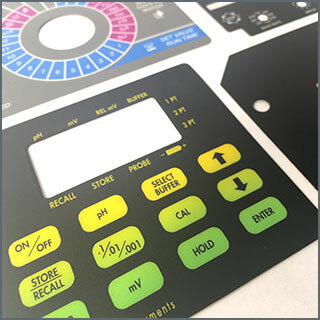 AGE Nameplate exclusively uses 3M adhesives, patterned-cut if necessary, to provide years of lasting and worry-free use. 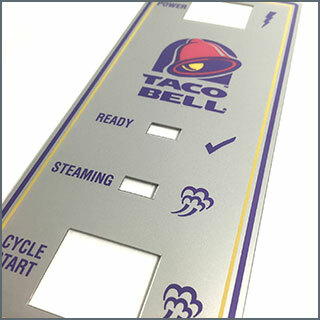 The heart of technology at AGE Nameplate: An innovative spirit and a “can do” attitude are the driving forces that have engineered thousands of custom graphic overlays over the past 40 years. Go ahead, push the envelope: Nothing is too complicated for us!